‘This film programme takes you along, through, inside, over and most importantly, under. No matter if the films cover different histories and timeframes, as they criss-cross the kilometres from Turkestan–Siberia, Belgrade–Ljubljana, Lebanon–Palestine or across Thailand’s networks. The sound of these trains’ horns, pistons and wheels on track are easily recognisable, forming a distinct and therefore universal language.’ Jenny Brownrigg, Exhibitions Director, The Glasgow School of Art. We are delighted to be showing a selection of films over three days this 13-15 July, as part of our Surrender Your Ticket screening weekend. Join us for a range of films that take us into distant regions and, in some cases, times. See the vast expanse of 1920s USSR as the first major infrastructure project of Stalin’s Five Year Plan connects Turkestan and Siberia; immerse yourself in the Thai railways over the course of a journey lasting two days and two nights; join brothers Francis, Peter and Jack as they travel haphazardly across India together. For a flavour of the programme, download our screening booklet by clicking on the image above and read Jenny Brownrigg’s excellent introduction. 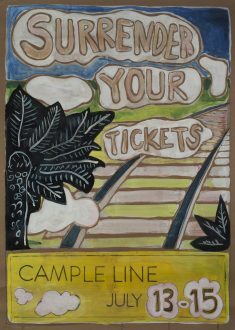 Many thanks to Charlie Hammond for his wonderful hand-painted cinema poster.